In the United States, the mortar and pestle has developed something of a reputation as obsolete and inefficient—a kitchen accessory that offers plenty of nostalgia but little utility. But it shouldn't be underestimated. For thousands of years, the mortar and pestle was one of the very few implements our ancestors relied upon to cook. Our predecessors had fire, sharpened rocks for cutting, vessels to contain their food, and, crucially, they had stones and wood to pound and grind it all. Today, the mortar and pestle remains a crucial tool in culinary traditions around the world, and it deserves to be treated as an essential in every kitchen. Not just because it served our ancestors so well, but because it continues to do what no other item in the kitchen does: smashing fibers and cells apart to fundamentally transform their texture and release their full aroma and flavor. That's something a blade can't ever do as well. Mapped across human history, the importance of the mortar and pestle (and similar implements used to crush and pulverize foods) is staggering. * Hominids came onto the scene somewhere between five and 10 million years ago. Between two and three million years ago, they figured out how to make stone tools to cut and chop foods. * It also goes way beyond food: The steady beating of a pestle in a mortar was one of the early activities that birthed work songs—music timed to the rhythmic activities of preindustrial life. We'll never know what our music today would be without the thousands of years of thuds that led to it. Somewhere in the ballpark of 500,000 to one million years ago, they mastered fire. We modern Homo sapiens made our appearance around 100,000 to 200,000 years ago, and archaeological evidence shows us using mortars and pestles about 50,000 to 100,000 years after that. ** Agriculture wouldn't arise until much later, roughly 10,000 years ago. That's right: The mortar and pestle well predates agriculture itself. ** I'm rounding off here; cut me some slack. Let's just stop and think about this for a moment. We had fire, and we had tools for cutting, and then we had mortars and pestles. And that's pretty much all we had to prepare our food for a really long time. These fundamental instruments of cooking didn't change all that much until the last century or so, when the eras of industry and electricity ushered in new, easy, and speedy appliances, like the blender and the food processor, pushing the mortar and pestle aside. But for all their convenience, these newfangled jars and bowls outfitted with whirling blades don't do quite the same thing that a mortar and pestle can do. They mince and chop effortlessly, but the mortar and pestle crushes. Yes, it takes some elbow grease to use a mortar and pestle, but that effort is worth it. And honestly, most of us in this country are so desk-bound these days, a little additional physical activity is hardly something we're in oversupply of. Even if we decide to put in a little extra sweat in the kitchen, success with a mortar and pestle still depends on having the right kind for the job. There's nothing more frustrating than toiling away at a pesto or curry paste, only to have all that work not pay off. Part of the problem is that not every mortar and pestle design is good for every mortar and pestle task—there are a heck of a lot of jobs that a mortar and pestle can do, and just as many varieties of mortars and pestles to match them all. Making it worse, more and more completely useless mortars and pestles have junked up the market as our use of them has waned; they may look nice, but they don't work at all. With our loss in familiarity has come a decrease in knowledge of which ones are good for what. It's time to rectify the situation. A large pestle: Just as you wouldn't choose a dinky little toy hammer to drive large nails into wood, you don't want a narrow, skinny, or short pestle when working in a large mortar. 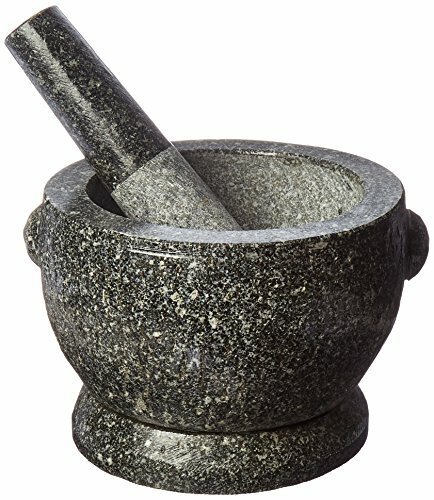 If the pestle is too short for the mortar, it's impossible to use it without banging your hand against the mortar's edge. Similarly, if the head isn't broad enough, it will simply push ingredients around instead of pulverizing them. A stone mortar: Though there are exceptions, in most cases you're better off with a solid stone mortar. Stone such as marble or granite is strong, dense, and unyielding, giving you a powerful surface against which to crush things; it's also not nearly as brittle as ceramic, meaning you can really drive some force into it without worrying that the material will crack or chip. Wood, meanwhile, can be a great pestle material in some instances, but is less effective as a mortar. The fact that it has a density and hardness similar to those of many foods we grind makes it less effective—much as diamonds are used to cut glass, we want to use a harder material to crush or grind substances like spices. An unpolished interior: Avoid mortars with glossy, smooth bowls, which lack the abrasive qualities crucial to properly shearing and grinding foods. A round bowl shape: An evenly round bowl shape makes it much easier to swirl the pestle and grind everything in its path. Cylindrical mortars with sharp corners at the bottom are harder to get into with the pestle, making it more difficult to grind and smash the contents down. Other considerations, such as what material the pestle is made from, depend on the situation. I'll explain further below. Mortars and pestles come in a variety of materials, shapes, and sizes. Finding a good large one, though, can take some work. A large mortar and pestle should have a roughly eight-inch diameter and at least a four-cup volume. Be sure to check these specs, since many companies sell "large" mortars that have a maximum volume closer to two cups. Though smaller ones can certainly be useful, they also happen to be just the right size to function as displayable knickknacks; the absence of good larger options is confirmation that few people intend to get much use out of these things. If you want to make a true pesto sauce or Thai curry paste, or any of a wide range of other aromatic sauces and pastes from around the world, a large mortar and pestle is a necessity. Smaller ones simply can't contain or contend with the volume and variety of ingredients these recipes require. For several years, I used a large ceramic mortar and pestle that I'd bought at a well-known national cookware store. I was thrilled when I first spotted it on the shelf—the only one with a mortar big enough to make real-deal pesto a possibility. But over time, I began to suspect that it wasn't really up to the task. My pesto came out okay, but it wasn't as emulsified and creamy as it should have been, and it was more than a small chore to make it. I'd tap relentlessly while making very little progress, and the high-pitched clanging of the pestle against the mortar would quickly drive me crazy. Only later, when I invested in other mortars and pestles, did the shortcomings of that ceramic one become fully clear. First, the pestle on my particular ceramic set was narrow relative to the size of the mortar's bowl. This made it much less effective, requiring more strikes and movements to crush the food properly, and leaving way too much space for all of that food to escape to. Its narrow shape also made it act more like a pool cue than an implement for crushing things: With each strike, the food would shoot out to the sides, often still whole. Ceramic is also a challenging material for many mortar and pestle tasks in the kitchen. It's very hard, like stone, but also more brittle. Where it should excel at crushing tough ingredients, it doesn't, because the force required could crack the ceramic. For this article, I compared three large mortars and pestles: the ceramic one that has failed me for so long, a Thai granite mortar and pestle, and a Mediterranean marble mortar with an olivewood pestle. Here are my favorites of the three. With both parts made of rock-solid granite, the Thai mortar and pestle is (literally) a heavy hitter, and arguably the most versatile type of large mortar and pestle you can own. Its heft and weight, especially when combined with the stone-on-stone action that the all-granite build provides, make it ideal for one of its intended uses: making a Thai curry paste. The large stone pestle can break down leathery dried-chili skin and tough seeds, and bust apart the fibers in some of the tougher aromatic vegetables, like galangal and makrut lime leaves. The heft and decent size of the Thai granite pestle made it possible to break down tough Thai red curry paste ingredients. It was a fair amount of work, but this was the only mortar and pestle to properly get the job done. Because the inside of the mortar bowl and the pestle head aren't polished, they have slightly abrasive surfaces that also make them good for grinding. This advantage is particularly apparent when you're grinding dry spices, which the Thai mortar and pestle did better than the other varieties that I tested. The unpolished granite surface made a finer spice grind more quickly than the other mortars and pestles tested. In a pinch, you can also use this type of mortar and pestle for pesto and related sauces, though it doesn't do quite as good a job as the Mediterranean mortar and pestle recommended below. The granite pestle head is fairly large, but not quite large enough to break down tender basil's more delicate fibers as quickly and effectively as the Mediterranean wooden pestle. In my tests, the Thai mortar and pestle yielded a slightly stringier pesto than its Mediterranean counterpart, though the results were still good, and much better than what emerges from most food processors. It's also worth noting that the Thai granite mortar and pestle doesn't generate the shearing forces necessary for forming a really good emulsion; this, again, is related to the pestle's slightly smaller size. This means your pesto may not come out quite as creamy (or you'll work harder and longer to get it there), and you'll have a much harder time forming a mayonnaise or aioli in it. One more downside: The Thai granite pestle is heavy, which means your arm will feel more fatigued more quickly. Maybe that's a good thing if you're looking for creative ways to sneak some extra exercise into your life, but it's a challenge you should know about before committing to this design. In the south of France, Italy, and other Mediterranean regions, marble mortars with wooden pestles (often made of olivewood) are quite common. It's next to impossible to find this variety in US stores, unless you get lucky and find one at an antiques shop or estate sale. They can, however, be ordered online. I bought mine through an Italian vendor on Etsy, and it's an object of pure beauty. It may be surprising to learn that you can make an emulsified sauce in a mortar just by pounding it with the blunt head of the pestle, but indeed it is possible: Where a whisk's head of wires breaks up oil into tiny droplets, dispersing it in the water medium for a proper emulsion, a mortar and pestle utilizes shearing forces to achieve similar results. The Italian mortar and pestle made the smoothest, creamiest pesto, and it wasn't even that much work to do it. Even pesto sauce, when made well, is emulsified, for a creamy, not oily, texture. What makes this particular mortar and pestle well suited to that job is largely the pestle design itself—the wooden pestle here is big and round, offering lots of surface area under which to shear the oil. The marble mortar's large wooden pestle makes much quicker work of the garlic than the ceramic mortar's narrow pestle. That large pestle size is also what makes this tool so good at smashing more tender ingredients, like garlic, pine nuts, and basil leaves. With just a few quick strikes, the garlic is smashed to bits, the pine nuts are crumbled, and the basil leaves are bruised and shredded. A smaller pestle head would require many more strikes to achieve the same result. What's nice, too, is that the wooden pestle is softer than stone (though olivewood is still plenty hard), which means you don't have to suffer through a series of loud, high-pitched stone-on-stone cracks when you're smacking at thin basil leaves. The whole experience is just a lot more pleasant. For these kinds of sauces, this mortar and pestle outclasses the Thai granite one on all fronts. It's quicker, more effective, and less tiring to use. For pesto and similar sauces, the Mediterranean marble mortar and olivewood pestle can't be beat; it rapidly makes a smooth and creamy sauce. Where this mortar and pestle fails, though, is at breaking down tougher ingredients, such as the ones that go into a Thai curry paste. The large wooden pestle just doesn't have the same intense striking force that the Thai granite one does, which means it struggles to grind dense, hard spices as finely, let alone produce a curry paste that's properly paste-like. On top of that, the marble is more prone to staining, as you can see in the below photo. The Thai red chilies left their mark (though these stains eventually faded with subsequent use). Red chili stains on a marble mortar. For this reason, the Thai granite mortar and pestle is my overall top pick: It works better as an alternative for making pesto than the Mediterranean one does as an alternative for making curry pastes. But, and this is a big but, if you know you won't make curry pastes with your mortar and pestle, the Mediterranean one is my top pick for you. You can always use a smaller marble or granite mortar and pestle to grind spices, and this one does the absolute best job with pestos, mayos, and the like. It's by far the most pleasurable to use. You can buy one from this seller on Etsy. They come in a variety of sizes, though I got the 24cm model. It's not cheap, and neither is the shipping, but it'll last you a lifetime and make an amazing family heirloom for future generations. Small mortars and pestles, of about one cup in volume, have many fewer uses in the kitchen, but that doesn't mean they're not an essential tool. They're less versatile, but no less important. Above all else, they're good for grinding whole spices into a powder. This may sound hard to believe, but I often prefer a small mortar and pestle for grinding spices over a dedicated electric spice grinder. In the time it takes to get a spice grinder out of my cabinet, unwind its cord, plug it in, load it up, grind my spices, completely empty it, and then clean it (always a drag! ), I could already be long done with the mortar and pestle. I use a spice grinder these days only if I'm making a very large batch of ground spices that would take more time to do by hand. Small mortars and pestles are also good for making small batches of puréed garlic, ginger, and other ingredients. Just toss in a few cloves or pieces, smash them up, and you're done. People also use them to crush pills and do other nonculinary tasks, but that's beyond the scope of this article. Success depends on having the right small mortar and pestle. I tried three types—an all-marble build, a brass one, and a wooden one—to figure out which kind worked best. Throughout my tests on smaller mortars and pestles, the marble one I used consistently came out on top. A small granite one would work just as well. The brass mortar and pestle, while very handsome, had such a smooth interior that most ingredients just slid around, avoiding being crushed. The wooden one, meanwhile, had no heft; it made me imagine what chewing hard foods without teeth would be like. A pestle that's too short for its mortar is a major design flaw. As you can see in the photos below, the marble mortar and pestle did a much better job of grinding black peppercorns than the other two did. A big part of its advantage was the abrasive quality of the unpolished stone surfaces. The marble mortar and pestle set was the most effective at grinding black peppercorns. The marble set also made a garlic purée much more quickly and thoroughly than the other two. Once again, that abrasive stone surface had a lot to do with its success. Of course, this doesn't mean that brass and wooden mortars and pestles are to be avoided at all costs, or that they're not good for anything. There may be some tasks at which they excel, though I'd argue those tasks are less common than the primary ones of puréeing ingredients and grinding spices. I'm linking to several different sets here because there's a lot of variety at this size of mortar and pestle, and all the ones shown will work similarly well. Choose whichever design appeals the most. The world is a big place, and pretty much everywhere in it has at least one type of mortar and pestle, if not multiple. Most have evolved to work with the specific culinary traditions from which they originate, and so there's hardly a way to be comprehensive about all the mortars and pestles one could own and use. That's part of what makes an interest in mortars and pestles fun. When you travel to a country or region that has a cuisine you're interested in cooking back home, you can try to learn more about the mortar and pestle options there, and maybe bring one back with you. I'll say from personal experience that, while it's hard to compete with cooking an Italian meal in Italy itself, using a gorgeous Italian mortar and pestle gives me some feeling of being transported there. So, though I can't cover every mortar and pestle out there beyond the basic types I discussed above, there are a couple I want to call out. The first is from Japan; the second is from Mexico. In Japan, the mortar is called suribachi and the pestle surikogi. The suribachi is usually made from pottery, while the surikogi is almost always some type of hardwood. The most distinctive feature of this mortar and pestle is the series of ridges scored into the pottery on the unglazed interior of the bowl. These ridges are called kushi-no-me in Japanese, and they add more abrasiveness than what you'll find in the smoother interiors of many other mortars. Grinding sesame seeds in a suribachi. The most common use for a suribachi is grinding sesame seeds, which pop and crumble against those ridges as the pestle swirls around, producing a paste that's fresher and more aromatic than premade sesame pastes. Other uses include mashing tofu, grinding spices, and even grinding meat, like chicken to make tsukune (chicken meatballs). Many people also use their suribachi for non-Japanese cuisine. I haven't tested it yet, but I've read that it can do a good job with pesto, for instance. Certainly, though, if you plan to cook much Japanese food at home, the suribachi will eventually make itself quite useful. Suribachi come in a variety of sizes, but I've found that a medium or large size is easiest for grinding sesame seeds. I'm a big fan of the products sold by Toiro Kitchen, including its suribachi. Also, make sure to order a bamboo scraper, which is very helpful for cleaning out the ridges after grinding. In Mexico, the molcajete is the mortar, while the tejolote (or temolote) is the pestle. They're made from porous volcanic rock, which ends up making it difficult to find a good one. Many companies sell "molcajetes" made from granite or some other rock—I've even heard of less scrupulous vendors making them from concrete—which you should avoid. The porous rock is key here, once again adding an abrasive element to help grind down pepper skins and seeds and other stubborn ingredients. A trip to Mexico is arguably the easiest way to track down a good, real molcajete, but you can find them in the States, too. This one is available on Amazon and appears to get good reviews (and the reviewers seem to think it's legitimate volcanic rock). I also recently bought one from MexGrocer.com, but haven't had a chance to test it out yet. Be careful not to confuse the molcajete with the metate, another Mexican grinder that is larger and flatter, used to grind corn into masa for tortillas and tamales. 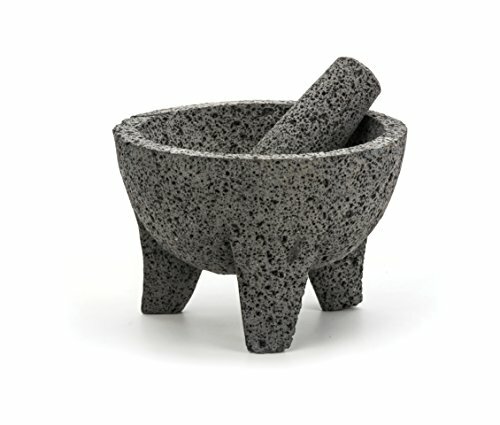 Molcajetes are most frequently used to make salsas and guacamole from scratch, and if you watch videos of guacamole being made in Mexico, it quickly becomes clear just how incorrectly most of us are making ours (but, of course, we have a good recipe for you here on Serious Eats). The aromatics are often charred first, then crushed, not chopped, using the power of the molcajete. One tip: Unless you buy one that's pre-seasoned, you will have to season your molcajete first, a process that involves grinding dry rice and then large crystals of salt into the stone to smooth the surface and remove loose volcanic dust. This video walks you through the process, and though it's in Spanish, those who don't understand the narration should still be able to follow the steps as shown.